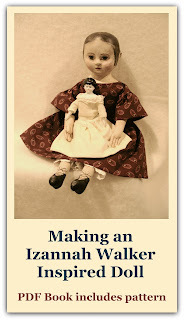 What is it that calls us to make dolls inspired by Izannah Walker? Do you know the reason? Please leave a comment if you're a dollmaker and tell why Izannahs dolls inspire you. Thank you for posting my doll!! I really enjoyed making her!! I love the simplictic beauty of the Izannah Walker Doll..but mainly.... the mystery behind each doll! I would love to know if they were really portrait dolls...since each one is so different in it's look?Plus...HOW were they obtained in the 1800's and also....what was the price? 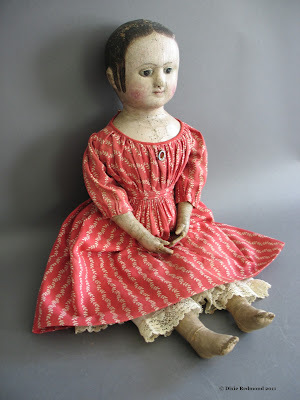 I love the simplicity of Izannah Walker doll, which truly, there is no simplicity, her dolls only appear that way, its so hard to explain, but for those who have tried to duplicate her dolls, know what i mean, i am sure.